About once a week I get to leave Stalag 13, also known as my office trailer, and venture up the hill to the post office. This morning Kansas is beautiful; around 80 F (26.6 C for the rest of the world), with a nice breeze. By this afternoon it will be a totally different story, with a temp of 95 F, and wind gusting to around 40, and about 60% humidity. I hop in my car, roll down the windows, and prepare to take advantage of the perfection of this particular Tuesday morning. On my drive up the hill, I notice the dogs in the car ahead of me are taking advantage of it too. I see a white pup, with a black nose and floppy ears first. His head is bobbing all around, trying hungrily to grab a scent of something, jowls blowing in the breeze, ears flipping all around and even making a circular motion one time, because this pup can’t keep his head still just to enjoy the breeze in his face. I have no idea what the dog’s age is, but it’s pretty obvious he’s a pup, with his head darting all around like he’s going to miss something on the ride, and might never get the chance to see it again. Unable to stand it any longer, he makes his way to the other window, hoping to catch a glimpse out of it. That’s when I notice the all black face of another dog that was obscured by all the pup’s bobbing and weaving. We stop at the light and I can see the gray on the old man’s nose. He is calm. He lifts his face to the sun, inhaling slowly, savoring the bouquet of the morning. He appears tranquil and comfortable with where he is at, in this particular space and time. The pup doesn’t even annoy him as he makes his way back and forth along the seat, as he remembers he was young once and he too felt the need to run at life like there wouldn’t be enough time to smell everything along the way. I have to turn to get to my destination and they continue on. When I stop, I sit for a second, thinking about how I can relate to both those dogs. I too want to be tranquil and comfortable with where I am at, and some days I can. Some days I can stop along my way and savor life. Other days I am still the pup, running from one thing to another hoping to find an exciting adventure. I decide being a little bit of both is just fine with me. 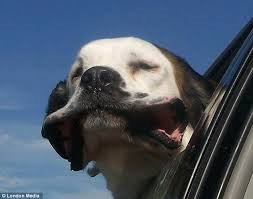 I step from the car and lift my face to the sun, feel the breeze on my face, and inhale life. Would you hold my hand? I’m scared of heights. I so much look forward to cool mornings that I am awake nights, just waiting for the sunrise that promises the slight dip in temperature that allows me to sleep until noon.